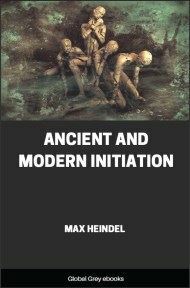 Max Heindel's mysticism is set firmly in the western tradition of the Gnosis. 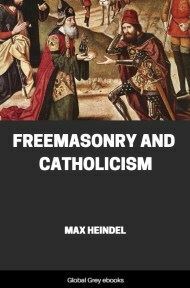 Following a series of disappointments and ill health, Heindel claims to have been visited by a Spiritual Being, who he identified as an Elder Brother of the Rosicrucian Order. From this entity he received a compelling explanation of the spiritual evolution of both the Cosmos and Humanity, couched in terms best suited to the logical, linear mind of western culture. 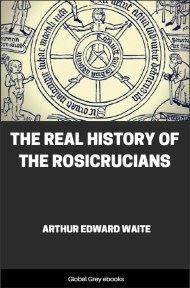 'The Rosicrucian Mysteries' is an elementary exposition of these teachings and training methods, and a perfect introduction to the philosophy of this important teacher of the Western Mystery Tradition. 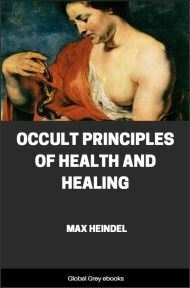 Before entering upon an explanation of the teachings of the Rosicrucians, it may be well to say a word about them and about the place they hold in the evolution of humanity. For reasons to be given later these teachings advocate the dualistic view; they hold that man is a Spirit enfolding all the powers of God as the seed enfolds the plant, and that these powers are being slowly unfolded by a series of existences in a gradually improving earthy body; also that this process of development has been performed under the guidance of exalted Beings who are yet ordering our steps, though in a decreasing measure, as we gradually acquire intellect and will. These exalted Beings, though unseen to the physical eyes, are nevertheless potent factors in all affairs of life, and give to the various groups of humanity lessons which will most efficiently promote the growth of their spiritual powers. In fact, the earth may be likened to a vast training school in which there are pupils of varying age and ability as we find it in one of our own schools. There are the savages, living and worshipping under most primitive conditions, seeing in stick or stone a God. Then, as man progresses onwards and upwards in the scale of civilization, we find a higher and higher conception of Deity, which has flowered here in our Western World in the beautiful Christian religion that now furnishes our spiritual inspiration and incentive to improve. These various religions have been given to each group of humanity by the exalted beings whom we know in the Christian religion as the Recording Angels, whose wonderful prevision enables them to view the trend of even so unstable a quantity as the human mind, and thus they are enabled to determine what steps are necessary to lead our unfoldment along the lines congruous to the highest universal good. When we study the history of the ancient nations we shall find that at about six hundred years B.C. a great spiritual wave had its inception on the Eastern shores of the Pacific Ocean where the great Confucian religion accelerated the progress of the Chinese nation, then also the religion of the Buddha commenced to win its millions of adherents in India, and still further West we have the lofty philosophy of Pythagoras. Each system was suited to the needs of the particular people to whom it was sent. 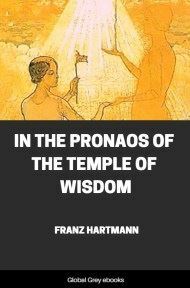 Then came the period of the Skeptics, in Greece, and later, traveling westward the same spiritual wave is manifested as the Christian religion of the so-called "Dark Ages" when the dogma of a dominant church compelled belief from the whole of Western Europe. It is a law in the universe that a wave of spiritual awakening is always followed by a period of doubting materialism; each phase is necessary in order that the Spirit may receive equal development of heart and intellect without being carried too far in either direction. The great Beings aforementioned, who care for our progress, always take steps to safeguard humanity against that danger, and when they foresaw the wave of materialism which commenced in the sixteenth century with the birth of our modern science, they took steps to protect the West as they had formerly safeguarded the East against the skeptics who were held in check by the Mystery Schools. who founded the mysterious Order of the Rosy Cross, concerning which so many speculations have been made and so little has become known to the world at large, for it is the Mystery School of the West and is open only to those who have attained the stage of spiritual unfoldment necessary to be initiated in its secrets concerning the Science of Life and Being. If we are so far developed that we are able to leave our dense physical body and take a soul flight into interplanetary space we shall find that the ultimate physical atom is spherical in shape like our earth; it is a ball. When we take a number of balls of even size and group them around one, it will take just twelve balls to hide a thirteenth within. Thus the twelve visible and the one hidden are numbers revealing a cosmic relationship and as all Mystery Orders are based upon cosmic lines, they are composed of twelve members gathered around a thirteenth who is the invisible HEAD. There are seven colors in the spectrum: red, orange, yellow, green, blue, indigo, and violet. But between the violet and the red there are still five other colors which are invisible to the physical eye but reveal themselves to the spiritual sight. In every Mystery Order there are also seven Brothers who at times go out into the world and there perform whatever work may be necessary to advance the people among whom they serve, but five are never seen outside the temple. 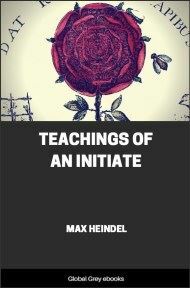 They work with and teach those alone who have passed through certain stages of spiritual unfoldment and are able to visit the temple in their spiritual bodies, a feat taught in the first initiation which usually takes place outside the temple as it is not convenient for all to visit that place physically.